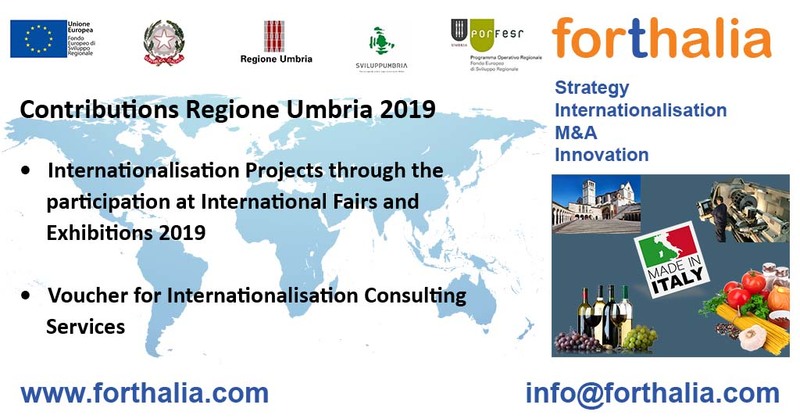 Two new incentives for Internationalisation from Regione Umbria, for Internationalisation Consulting Services and participation at International Fairs and Exhibitions. Sviluppumbria, in implementation of the provisions contained in Axis III (COMPETITIVENESS OF SMEs) of the POR FESR 2014-2020, Action 3.3.1. 'Export promotion projects for companies and their aggregate forms identified on a territorial or sectorial basis', with this Notice intends to favor the participation at International Fairs and Exhibitions, identified with DGR 1393/2018, of the micro, small and medium-sized enterprises (MSMEs) located on the regional territory, aiming individually at international markets, with for strengthening competitiveness, encouraging internationalisation and the promotion of export. Micro, small and medium-sized enterprises (MSMEs), including freelancers, can apply. With this Notice The Umbria Region wants to support the Internationalisation Projects presented by MSMEs from Umbria through the participation at 1 or more International Fairs and Exhibitions among those identified in Annexes 3) and 4) of the Notice, up to a maximum of 3, to support the development towards foreign markets. if the internationalisation project only involves participation in 1 fair held before the application was submitted, the Application will be considered ineligible. However, expenses prior to the date of application are only admissible for the booking of exhibition spaces of the fairs indicated in the project. The financial resources available for this Notice amount to € 900,000.00 and are covered by the funds available in the 2014-2020 ERDF POR Axis III Activity 3.3.1, as required by the DGR 1393/2018. The public notice is addressed to micro, small and medium sized enterprises (MSMEs) including freelancers from Umbria who intend to make use of Consulting Services for Internationalisation. Beneficiaries can submit the application for the contribution starting from the date of publication of the Notice on the BURU up to 1.00 pm on 5 July 2019 unless the resources have all been allocated before such date. By specialist Internationalisation support is meant a consultancy activity aimed at providing the company with support during the phases of the internationalisation process to which they are interested, from short to medium term growth to the phase of entering new foreign markets, making use of also of new digital tools, and / or strengthening the existing ones. for the temporary reinforcement of the company functions essential for the internationalisation process, through the availability of a Temporary Export Manager (TEM). The TEMs must be identified exclusively among the companies registered in the appropriate list of the MIiSE (Annex 6). A maximum 6-month assistance contract can be activated for a maximum amount of € 14,000.
design and creation of design and brands for penetration into foreign markets. for web marketing activities aimed at target markets. The service referred to in type 1) cannot be requested for companies that already have an active TEM granted by the Ministry of Economic Development (MISE) under the Notice provided for by the MISE Decree of 7 April 2015.